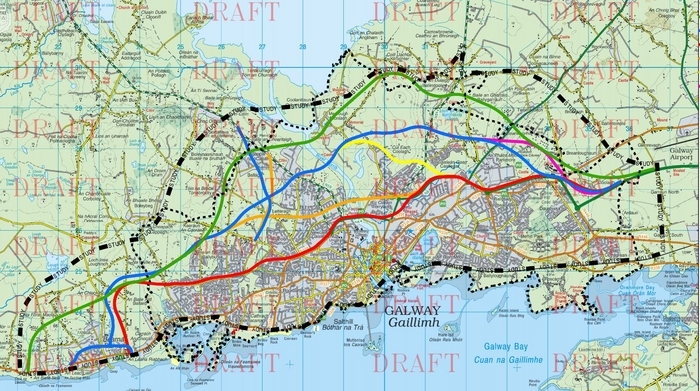 A deputation from Galway is to travel to Europe to discuss proposals for a new city bypass and the option of returning to the original route which failed at planning stage. It was decided at a special meeting of the Galway County Council on Monday evening that city and county councillors, local TDs, and community representatives will meet MEPs and members of the European Commission to discuss various options. The previous planning application was refused by the European Court of Justice following a challenge by environmentalists who claimed the project was in violation of Article 6.3 of the EU Habitats Directive, on the grounds that it posed a threat to bog cotton in Tonabrocky. There is hope in some quarters that if the old application was made under Article 6.4 of The European Habitats Directive, it could be successfully advanced. According to this part of the legislation, a project may be carried out in spite of a negative assessment of a priority habitat, if it is proved prove there is no alternative, or for reasons of overriding public interest [IROPI], including those of a social or economic nature. It was suggested by Corrandulla based councillor James Charity that the project may succeed under the IROPI clause. His reading of the previous court decision was that it was an invite to make the application under Article 6.4. At Monday’s meeting, N6 project manAger Eileen McCarthy of Arup Engineers revealed that the old Outer City Bypass route had remained an option up to last November when less damaging options were discovered. She believes the route will not get planning permission as the legislation is there to protect it and there are other solutions in place, [The six new proposals]. Meanwhile a motion by Carnmore based councillor Jim Cuddy, proposing to put a stop to the progression of the current six proposed routes and appealing to consultants to go back to the drawing board and make more realistic and acceptable proposals, was comprehensively defeated. It has been outlined by Arup Consulting Engineers that whichever of the six routes is chosen by mid April, a minimum of between 50 and 130 houses will have to be demolished to make way for the road. Every one of the 39 elected councillors spoke at length on the contentious issue and there was agreement across the board that a new road, to alleviate Galway’s substantial traffic problems, was needed. However many councillors were wishful that a bypass could be built without causing upheaval and disruption to homeowners, a sentiment that appears to be idealistic rather than realistic. Councillor Fahy outlined that he had been asked how he would react if his home was to be knocked. He said he would allow it to be knocked as “we have to think of the bigger picture”. He believed families would be making a ‘patriotic’ decision to leave their homes and they must be respected and compensated adequately. Councillor Thomás Ó Curraoin was again extremely vocal in his opposition to houses being knocked. “I don’t like wrongdoing and what is being done here is wrong. Is it right to be giving a preferance to what grows out in the wilderness ahead of people’s lives, children and health. I won’t go along with any route that knocks people’s houses. The road must go through the bog. This is pie in the sky, who should be here to take the flak for this are all the cronies who got the original route stopped - it shouldn’t be us or the officials of Galway County Council. A number of representatives were unhappy that the six proposed routes were all travelling through the city centre as opposed to what they felt was a more workable option- an outer ring road. Councillor Peter Roche remarked it appeared “to be a severance of the city, as opposed to an outer city bypass’’. Councillor Jim Cuddy, who tabled the defeated motion for consultants go back to the drawing board and come up with a new proposal, asked what arrangements would be made for people whose houses were going to be displaced. He believed the compensation from the CPO process would fall far short of the actual value of these homes. A number of councillors also expressed their wish to sit down with their city counterparts to hear their views on the contentious issue.